Often when a product is named after its birthplace, it isn’t intentional. It often happens as the result of associating the birthplace of an improvement or process to an existing product. Cement wasn’t invented in Portland (United Kingdom) but an abundance of superior raw material for cement turned a city of 13,000 people into a household name. 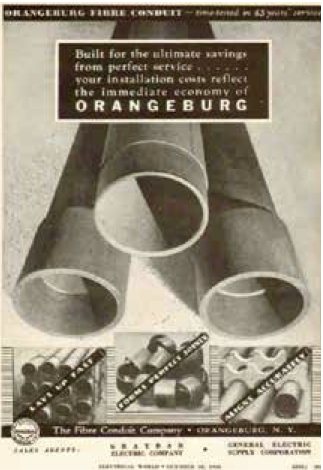 For Orangeburg, New York, the product was fiber conduit, an inexpensive alternative to metal pipe produced by the Fibre Conduit Company. Unfortunately, fiber conduit didn’t enjoy the success of Portland cement or Philadelphia cream cheese and its legacy became synonymous with premature failure up until it was removed from the international building code in 1972. Founded in 1893 by local businessman Stephen Bradley, the Fibre Conduit Company expanded several times in the area now occupied by Lowes on Route 303 and changed its name to the Orangeburg Manufacturing Company in 1948. The tubing, made with waste products from local industry had the desirable qualities of being inexpensive, easy to saw, and having no joints. The steam waste from local electric power generating plants and wood fiber from the local paper industry were good companions to his new pipe company. Waste steam was used to dry the wood fiber before it was sealed with coal tar. At its peak, 500 tons a week of the product were being produced locally. The company and its product prospered during its eighty year history. Since the mid 1800s America was either involved in, preparing for, or recovering from war and metal usage was heavily taxed. Finding an alternative to metallic pipe was highly lucrative and competitors quickly appeared. The resulting product was astonishingly cheap but proved to be too brittle and fragile for many uses, especially those that put the pipe, known as Orangeburg, under pressure. Its original application as a water pipeline was moderately successful with a 1.5 mile pipeline in Boston that remained in service for sixty years. The post-war construction boom led to new uses for Orangeburg as conduit for electrical wire with miles of the product still in use for this purpose at the Empire State Building and other skyscrapers. 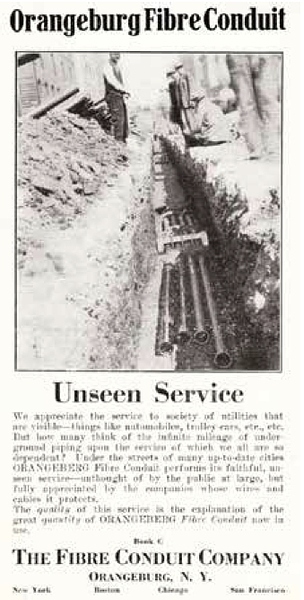 The 1950s and 60s housing boom created a high demand for inexpensive building materials and led to the use of Orangeburg pipe for sewers. The high failure rate of fiber conduit as a sewer pipe and the arrival of PVC spelled the end for fiber pipe. Building codes nationwide banned its use in the early 1970s. With only a 40 to 50 year lifespan when used as sewer pipe, many of the estimated 25,000 homes in the United States built with Orangeburg are nearing the end of their service life and will face expensive replacement costs. Although stronger, inexpensive products have since replaced it, Orangeburg pipe was once considered a cleverly resourceful product made with the waste from two heavily polluting industries during a time when raw material was in high national demand, but this fact has not withstood Orangeburg’s reputation as a poor performing sewer pipe loathed by homeowners, and so has sunk into nameless oblivion.